To the eye, a bright and deep golden colour. On the nose abundant stewed and candied fruits, accompanied by touches of sweet spice. With time, notes of mirabelle and preserved orange unfold in the glass. On the palate; a grand generosity. Intense cooked fruit and tarte tatin flavours express themselves in a mouth that is full and harmonious. Blend of the 2004 vintage: 66% Pinot Noir, 34% Chardonnay. 16 crus: 88% Grands crus and 12% Premiers crus. Exclusive use of the cuvée. Fermentation entirely in oak barrels. Only the very best vintages are elevated to the level of Bollinger R.D. - with time, 2004 revealed a beautiful aromatic potential and an extraordinary brilliance. Maturation: A very long maturation, more than four times longer than required by the appellation, for an infinite array of flavours: a true wine alchemy. Maturation carried out under natural cork. Recent disgorgement: Bollinger R.D. is released only a few months after it is disgorged. This recent disgorgement guarantees the remarkable freshness of the wine. Dosage: Very low. “Extra Brut”, 3 grams per litre. Bollinger R.D. will enhance all great gastronomic moments. R.D. 2004 marries perfectly with the most refined dishes, such as pigeon cooked pink or roasted scallops. The intensity of the wine makes it the perfect partner for an aged Gruyère or Comté. 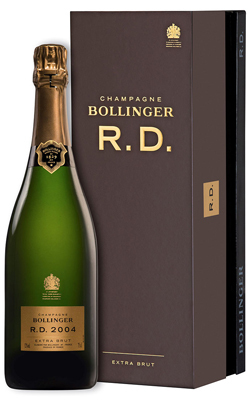 In order to showcase its unique style, we recommend serving Bollinger R.D. at a temperature of 8°C, then to appreciate the evolution of its aromas over the course of the tasting. To discover the freshness of recent disgorgement, Bollinger R.D. can be enjoyed in the year it was disgorged, or you may also choose to let it mature further: its potential for ageing is endless. “Recently Disgorged” means that disgorgement has taken place less than one year before commercial release. The wine offers freshness and extraordinary intensity due to its recent disgorgement, as well as the aromas of an old vintage which has been aged in the cellar for an exceptionally long time, all the while nourished by contact with the lees, and has blossomed during this time stored in perfect conditions. How is the concept of R.D. unique? The majority of Champagne Houses have always kept a collection of old wines in order to share with their family, close friends and special guests. The custom was that these old wines were especially disgorged a very short time before being tasted, so that those invited could share a perfect moment when the wine, just disgorged, would offer an extraordinary freshness and sumptuous aromatic expression. This is the boldness of both R.D. and Madame Bollinger who realised the greatness of these wines and was the first to commercialise them. She wanted to offer the entire world the chance to experience this tasting moment, considered at the time as “the ultimate in French Champagne”. This exceptional cuvée would be called R.D. for “Recently Disgorged”, and its label would be the first in history to bear a disgorgement date. R.D. stands for Récemment Dégorgé, Recently Disgorged: Madame Bollinger created this legendary vintage in 1967, giving the world the opportunity to taste a champagne aged on lees for an exceptionally long time. Her great vision; Enabling knowledgeable wine connoisseurs to share a very special moment, when very recently disgorged wine is as fresh and aromatic as ever. It was a small revolution in the world of Champagne... The daring Bollinger R.D. could only become James Bond’s favourite Champagne. In 1963, the first bottles of what was to become the legendary Bollinger R.D. appeared on the market. Madame Bollinger decided, in agreement with the House’s New York-based agent to release a limited quantity of bottles of “Réserve 1947” in the United States. The intention was to “create some competition for the special bottles”, in other words “Prestige cuvées” that other Champagne Houses were putting on the market at the time. Madame Bollinger’s great idea was to choose an older vintage that was disgorged late and prepared like an Extra Brut. This was a daring move at a time when aged Champagnes were not fashionable, but the House put into practice the strong intuitive belief that the oxidative stress of disgorging would give great freshness to the future Bollinger R.D. In 1967, after much hesitation concerning the final name of the cuvée (Late Disgorged, Late Disgorged Reserve), Bollinger R.D., standing for Recently Disgorged was chosen. Three vintages were launched simultaneously. The 1952 vintage in the British market, the 1953 in the Swiss and French markets and the 1955 in the US and Italian markets. It was this vintage followed by that of 1959 which really gained international renown for Bollinger R.D.